Goldwing Chrome - The Best Place on a Web to Buy GoldWing Stuff !!! Large selection of Goldwing Goodies - Chrome Accessories, Floorboards, Backrests and much more. Competitive prices. Fast Air Shipping. Secure 24-hr internet shopping. 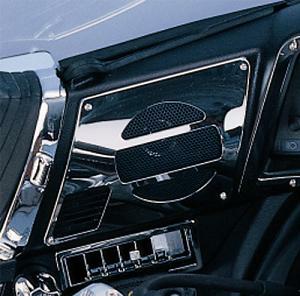 2-482 - Front Speaker Grills. From Show Chrome. By Show Chrome Accessories. Bright chrome plated steel accents. They come with double sided tape and four screws for secure installation. This is a copyrighted site. No material may be copied, duplicated, or copy-n-pasted without written consent of Gold Wing Chrome, Inc.